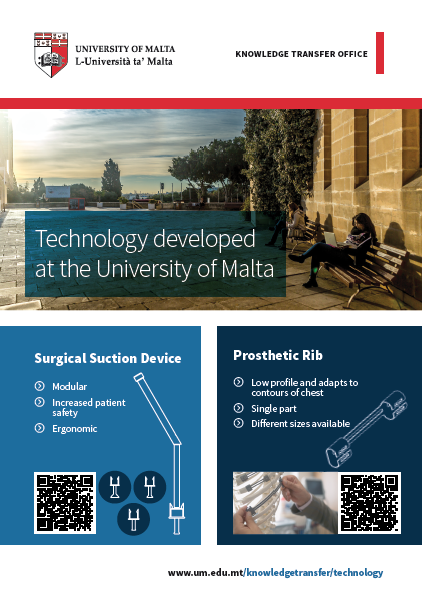 New technology in the Biomedical area is constantly being developed at the University of Malta. The technologies listed here focus on the Cardio Thoracic Field. The Knowledge Transfer Office is looking for licensees and development partners to take these technologies to market. We are looking for licencees, ideally orthopaedic product manufacturers, to manufacture and sell the product. For more information, click here. An increasingly common form of treatment for cardiovascular disease involves implanting a stent in an artery where a blockage is present. The stents which are currently being used are not always as flexible as required and may not behave in the same manner as a blood vessel would, causing stress within the blood vessel walls. Once stents are deployed, they also tend to shorten which may cause difficulties in placing the stent in the correct position within the vessel. 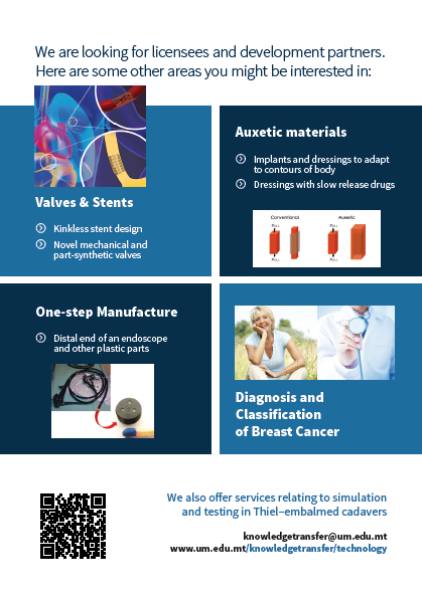 Our research team has developed auxetic stent designs to match the specific geometry of the blood vessel where they will be applied. When the stent is expanded to widen the vessel its length remains unchanged and its cross-section adapts to the shape of the vessel. This minimises the negative effects of current stent designs, making it easier for the stent to be correctly positioned. Such interventions would be more efficient, reducing operating times and costs, while sparing the patients from undue stress. We are looking for potential licencees and collaborators to develop a product for commercialisation. For more information, kindly contact the Knowledge Transfer Office. One might wrongly assume that when a volume of material is stretched it will always become thinner. Due to their peculiar internal geometry, auxetic materials grow wider when stretched. This unlocks a plethora of applications such as implants and dressings to adapt to contours of the body and dressings with slow release drugs. To find out more, kindly contact the Knowledge Transfer Office. We are looking for commercial partners interested specifically in licensing the design for the endoscope lens assembly. In addition we are interested in development work with companies which could benefit from multi-material injection moulding to improve product quality and/or manufacturing processes. A spin-out company has been set up to commercialise these technologies - Biotech Innovations Ltd. (C76539). Biotech Innovations intends to carry out research to develop more kits and to offer testing services around its technologies. We are looking for a manufacturing partner who would be interested in producing and distributing test kits to be used on the Luminex xmap platform. We are also looking for pharmaceutical companies who are interested in developing companion diagnostic tools for particular drugs.